For those who enjoy nature walks, the island of Lobos, which we visit every day in our boat trips, is a beautiful enclave, which contains singularities that will astonish the hiker, being a Natural Park, which was declared as such in October 1982, when El Parque Natural de las Dunas de Corralejo e Isla de Lobos was created, and reclassified as Natural Park in December 1994. 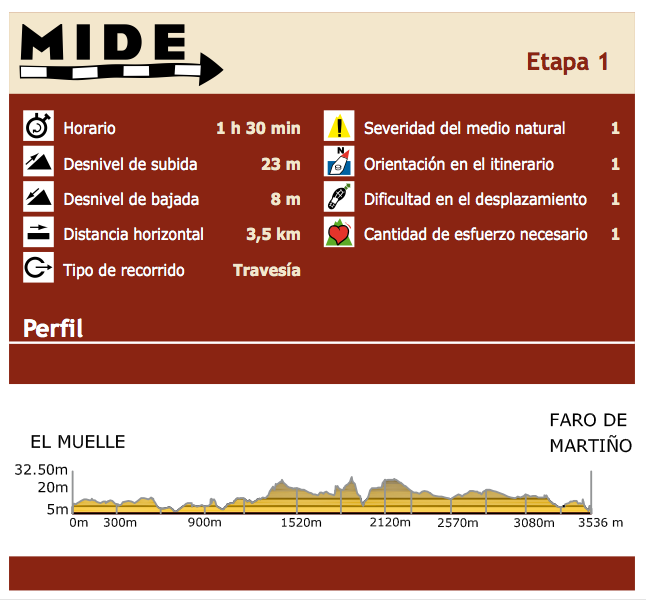 The following table lists the MIDE characteristics (communication system between hikers, with a scale that includes the technical and physical difficulties of the trails, to allow each hiker a better choice), where we can see that the difficulty of the trail is minimal. The trail that crosses the island represents the first stage of Fuerteventura GR-131 (long distance footpath linking the Canary Islands with the European path A7, about 5000kms, that departs from Hungary), so this step is particular, being in a separate islet to be accessed by boat. The adventure of this stage begins on the boat that takes you to Lobos Harbour, through what is known as El Río, a sea canal that separates the islet of Lobos from Fuerteventura just over one mile and where if we look closely we can admire some of the marine species that ply these waters, such as turtles, flying fish and even dolphins and other cetaceans. Lobos Harbour will welcome us with its calm turquoise waters, and once the sailing is over the hiking adventure begins. Upon arrival at Lobos Harbour we find two trails. We will take the one on the left, since the right trail leads to the houses of Puertito, which are not included in the tour, but we recommend visiting them at the end of this stage of the trail, because of its landscape beauty and calm. 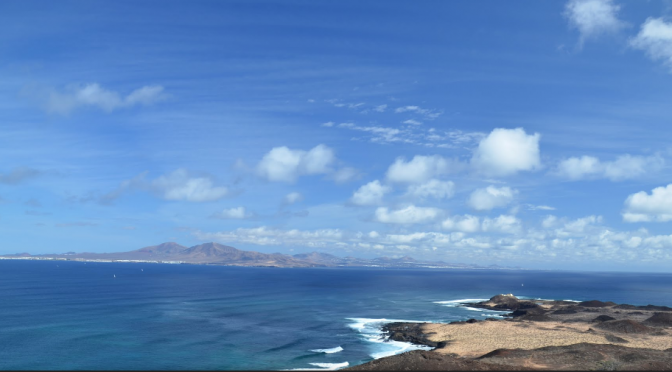 In the chosen path we’ll go through the volcanic “malpaís”, characteristic of the islet and the whole of Fuerteventura, up to Playa de la Calera (or Playa de La Cocha), with its fine sand and almost static water, which invite visitors to relax with water and sun baths. After a pause which can be used to take a dip, we continue the path, leaving the amazing Mountain Caldera on the left, with its 127-meter volcanic cone, swept away by the sea, which has turned the crater into a semicircular amphitheater at whose base the water breaks. We continue our journey, surrounded by the striking green of the Sweet Tabaibas (Euphorbia balsamifera), which are the exceptional inhabitants of this island, up to Caleta de La Madera, which we will sail round to finally get to Martino’s Lighthouse, located in the northern side of the islet of Lobos, which represents the final stage. At this point there is a crossroads; those who wish it can return the same path , but we suggest an alternative way (outside the GR trail), which also leads to El Puertito, crossing Las Lagunitas, which are wetlands (salt marsh near the coast that is affected by the flow of the tide; the sea water is held and it makes ponds or lagoons parallel to the coast that allow the settlement of endemic plant species and also the least representative in our Islands; all these species have in common the adaptation to high salinity conditions), where you can find plenty of species, among which the houseleek (Limonium ovalifolium ssp. Canariense) stands out, endemic to the islet of Lobos. Through this path back we also find cisterns and lime kilns, which tell about the history of this magical islet. Finally we’ll get to the houses which make up the village of Puertito, old fishing settlement which fishermen often visit nowadays to spend the weekends, except some of them who still live on the islet permanently. If you follow the links in this article you will find all the information about this paradise islet. 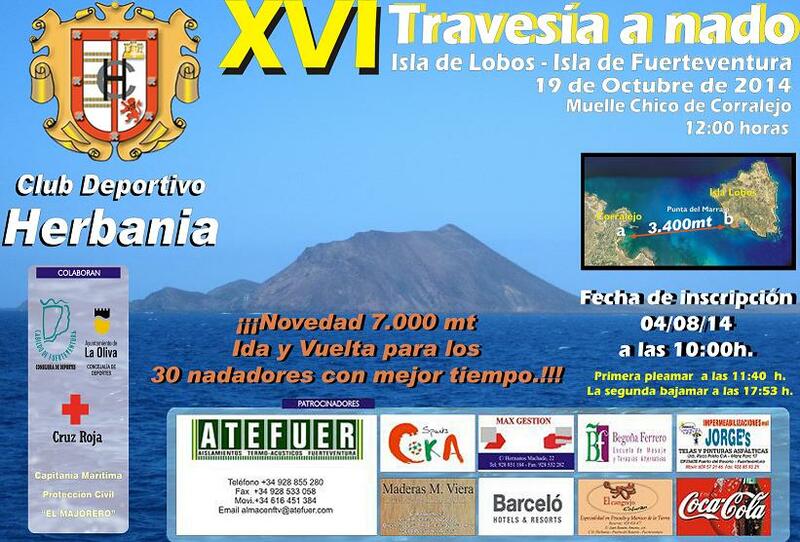 From October 28th and until November 29th the Art Centre Juan Ismael, in Puerto del Rosario, will host an exhibition where some of the archaeological Roman remains found during the excavations in Lobos islet will be shown. Two campaigns have already been carried out in these excavations in Lobos site 1, since 2012, where, as we said in one previous article in this blog, some archaeological remains of what would have been a Roman factory for the obtaining of purple dye (Stramonita haemastoma), dating back between the I Century B.C and the I Century A.D, have been found out. 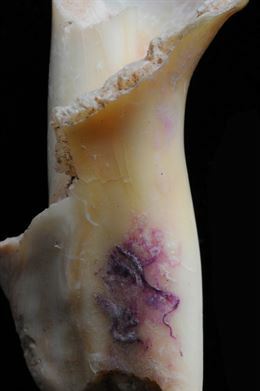 Hence the name of the exhibition: “Lobos 1, a Roman purple workshop”. 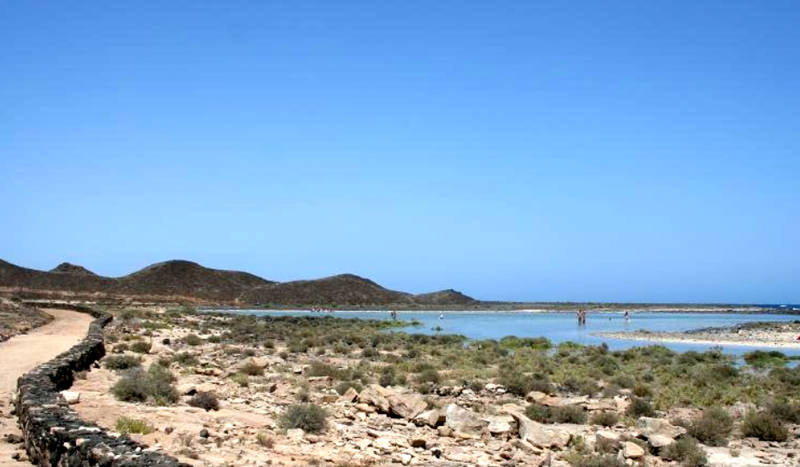 This site, located in La Calera or La Concha beach, to the South West of Lobos islet, will have a new campaign of diggings, result of an agreement between Fuerteventura Council, The Autonomous Organism of Museums, Some centres in Tenerife council and some scientists in the research project “Poblamiento y Colonización de las Islas en el Atlántico (PYCIA), from La Laguna University and the OAMC and there are big expectations that more remains that could be find tell us more about the history of the Canary Islands and the population of the Atlantic islands, through the Roman settlements dated to the Early Empire that, besides, also show that the boundaries and the influence of the Roman Empire spread far beyond it had been recorded up to now. For this reason many researches and approaches will have to be carried out again and the relationship between the Canary Islands and other Roman settlements of the time will be established. The exhibition shows a selection of manufactured Roman goods, from ceramic amphoras, used to transport and store metal iron and bronze items (needles to sew nets, hooks, punches…) to stone items related to the processing of purple dye, like crusher pebbles, anvils and mortars. The exhibition also shows shelly deposits specialised in Stramonita haemastoma, where we can see some fracture patterns of these molluscs and the way the glans used to get the purple dye were extracted. The exhibition can be visited in the Art Centre Juan Ismael, C/ Almirante Lallermand, Nº 30, in Puerto del Rosario, opening times from 10 to 13 and from 17 to 21h, every day except Sundays and Mondays, when the centre is closed. Our dear neighbour, Lobos islet, main spot in our daily boat trips towards its coast, is taking part in a remodelling project which aims to meet the needs of tens of visitors who get to its quay every day. Last summer they launched some restoration works in Lobos islet, in the area of the old restaurant. This area has become a resting area with W.C, benches and shadow to provide service to the masses of visitors who go to the islet every day. The old restaurant in Lobos islet, dating back to the 60’s, was an abandoned project in the 80’s, with a quite peculiar architecture, irregular plant combining cubic and curvy spaces, very different from the local architecture and that has now become, thanks to a project by the Technical office of Fuerteventura Council, a resting area —160m2— for visitors, whose finish is perfectly integrated in this natural site where pine wood has been used, following the environmental friendly line which is promoted, especially in such an important an area of environmental awareness as Lobos islet. The works in these facilities were finished one month ago, but the outside surrounding area remains to be laid out, so as to make it available to the visitors. There is no concrete date to inaugurate them, although it can’t take a long time. And together with this refurbishing process, The environmental department has also approved the project “Acondicionamiento y mejora del muelle de Lobos”, which is being dealt with by the Port authority in Las Palmas, in order to improve the conditions of Lobos quay, due to the fact that companies devoted to the transport of passengers to Lobos islet had been complaining for a long time about the poor state of such quay and about the difficulty to access it in days of rough sea. So, this project aims to improve the state of the quay and extend it, to make it safer when facing adverse weather conditions, and to ensure safe berthing regardless of the tide. The building of stone filling banks (stones thrown to the bottom so they can be used as foundations for the quay), that will take up around 25m long at the sea bottom. The building of a 1,6m wide berm on each side of the quay. The building of a 14,58m long and 8,1m wide quay. The restoration of the side slots. The building of an access stairway. We’ll keep you informed about the development of this refurbishment project, which is being studied in detail to minimise the environmental impact and provide a better service to the visitors without damaging the natural site which this islet, Biosphere Reserve, represents. It’s many those who ask us what are those fenced in excavations we find in Lobos islet, so we will leave this article for those who want to know a little about the history of our neighbour islet. At the beginning of 2012 it was found out, in the islet of Lobos, a site with archaeological remains dating back to the I century B.C and the I century A.D. 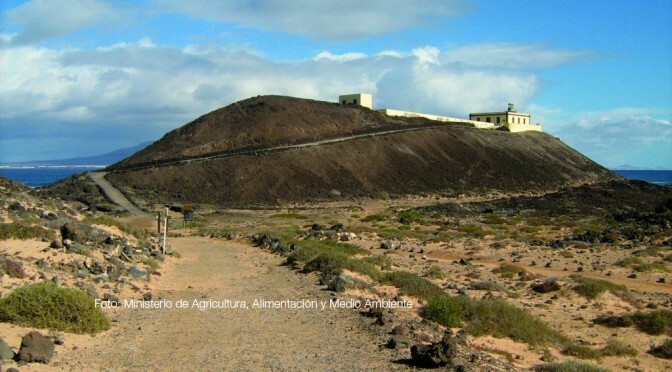 In November 2013 the diggings in the islet started, by means of a project called “Poblamiento y Colonización en las Islas del Atlántico”, aimed to study and research of these remains, and framed within the existing institutional agreement between the OACM in Tenerife (Autonomous Organization of Centres and Museums) and the Regional Office of culture and historical patronage of the Council of Fuerteventura. As studies and diggings have been developing, hypotheses have been made, and nowadays it is quite validated the one which states that the site belongs to Roman settlements, maybe just seasonal, looking for sea snails in the islet— Stramonita haemastoma or thais, known in the Canary Island as “carnadilla”—, from which they got the purple dye they used for the noblemen’s outfits at those times. What has allowed us to validate this hypotheses is the discovery of more than 70.000 specimens of these molluscs. This kind of site is the only discovery in the Canary Islands, and other similar sites have appeared in the island of Mogador and other points in the Atlantic African coastline, which proves that this route was already used by these great empires (Punic, Greek and Roman) to stock up not just on “carnadilla” for dyes but also on fish, as the area was really rich in tunidae. In the old times, purple on fabrics was the only sign of social distinction, from the Phoenicians to the Romans, as getting this dye was very expensive. From each snail just a few drops of the coveted dye could be extracted, used to dye the capes and garments of the highest offices; so this dye was an indicator of luxury and social distinction. Even the State itself was in control of its monopoly and organized trade and military expeditions to find the necessary products for the elaboration of this dye, which they then brought for its trade in the Mediterranean. Lobos Islet’s site has 108m2 (18 x 6), and excavations are making it deeper and deeper, as the remains which appear are on slopes and even part of the found walls are still under the earth, some 2m deeper. The hypotheses point out that the structures that are being dug up belonged to the rooms where they stored these molluscs. 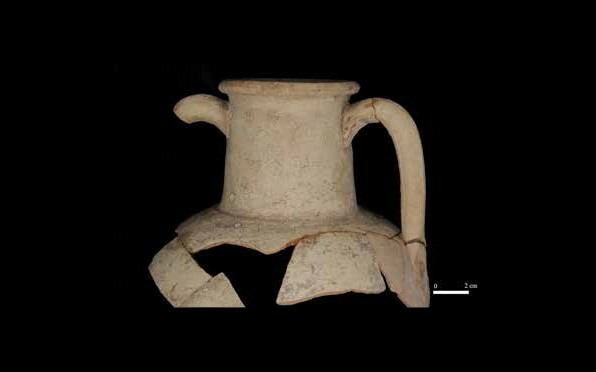 Some remains of pottery are also appearing, surely containers where they stored the molluscs, as well as remains of household and kitchen utensils, pieces of iron and bronze, fish hooks and nails, remains of amphoras, pans, lids… even bone remains from the animals of the time (sheep and goats). 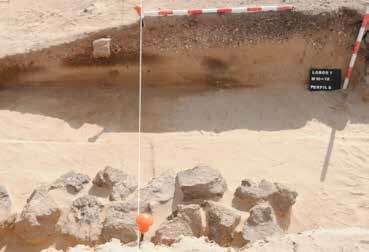 Excavations are expected to take place until the end of 2016 and they are being carried out by a team of eight professionals coming from the council of Fuerteventura, from the OAMC in Tenerife and the ULL, who keep shedding light on the history of the ancient settlers and colonists of these lands. 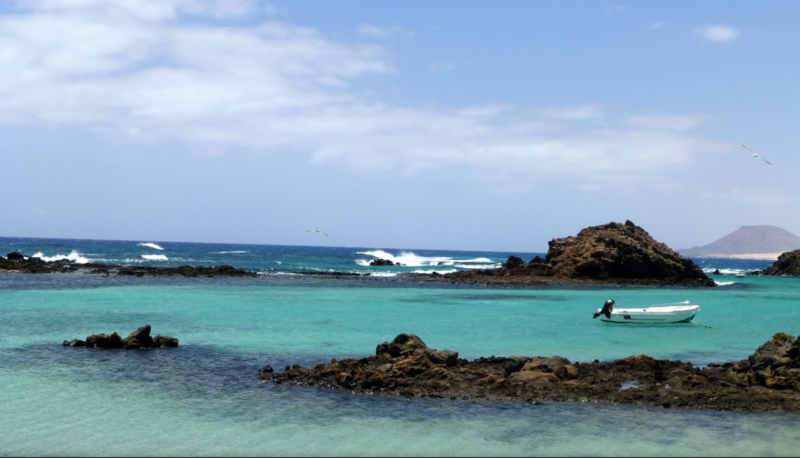 Just 2km away from Corralejo, the islet of Lobos —which we visit daily in our boat trips—, presents a series of attractions well worth to bear in mind in our holidays. 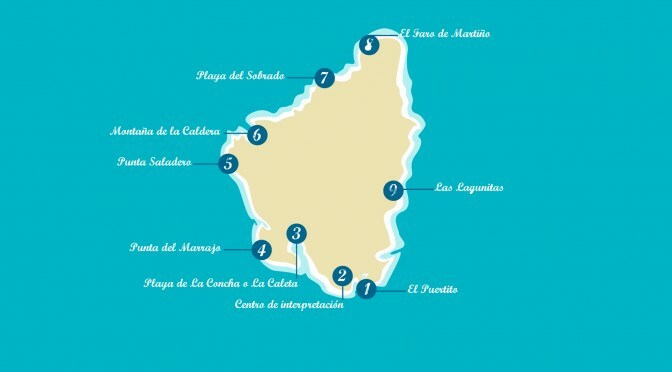 To make it easy, in Fuertecharter we show you this short guide with the main spots to visit in the islet. If you have a look at the presented diagram, number 1 is “el Puertito”, no doubt, for many, the most spectacular site in the islet, due to its full of life turquoise water — letting us see a sandy bottom typical of heavenly beaches— and to the big amount of big and small rocks that are shown by the low tide, making the landscape change considerably. In “El Puertito” we find the only human settlements in the islet, crowded in summer but almost uninhabited in winter, and we also find the only restaurant in this islet, where you can eat fresh fish and “paella” every day. 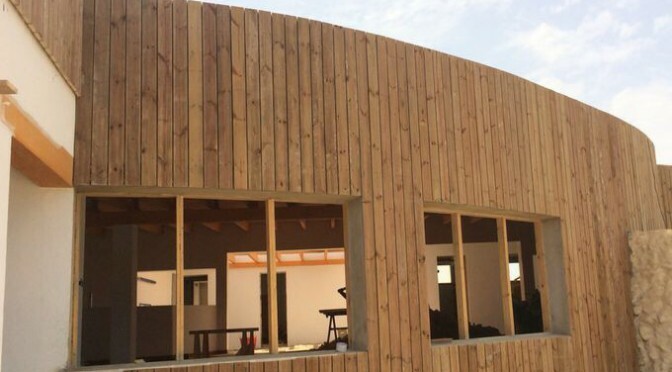 The next tourist attraction is the “Centro de Interpretación”, a wooden building where the visitors can find big informative panels about the history of Lobos islet, its landscapes, flora and fauna… and where we can also see a scale model of the islet, which will allow you to get an overall idea of the islet’s orography. Then we find “ La playa de La Concha” — called like this after its shape— also known as “La Calera”, as rhodolites were obtained in the past from this beach, calcareous structures of weeds that were used in the lime kiln, near the beach, to get lime to build Martiño lighthouse. This beach seduces all those who tread on its sand with the quietness of its crystal clear waters. This is a little bay closed by a stone and pebble barrier, which acts as a shield against the waves and turns it into a pool which is ideal to have relaxing baths. 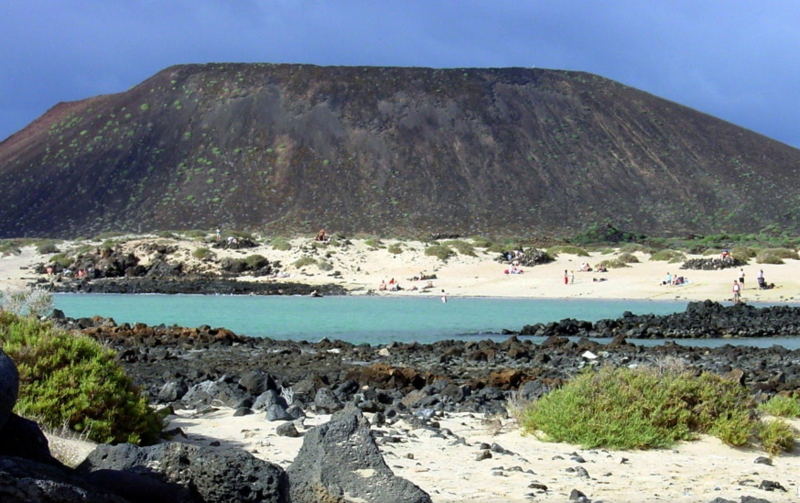 Near this beach the visitor will find an unfinished salt mine, an initiative by Andrés B. Zala, neighbour from Corralejo, who tried to obtain salt to preserve fish until they could take it to Corralejo. “Las Puntas del Marrajo y Saladero” are protrusions that act as breakers for what many consider to be the best waves in Fuerteventura. The wave emerging in “Saladero” is known as “Derecha de Lobos”,an internationally renowned wave which year after year attracts hundreds of tourist to our island. The wave in “Majarro” is also a long and noble right, much easier to reach for less experienced surfers. 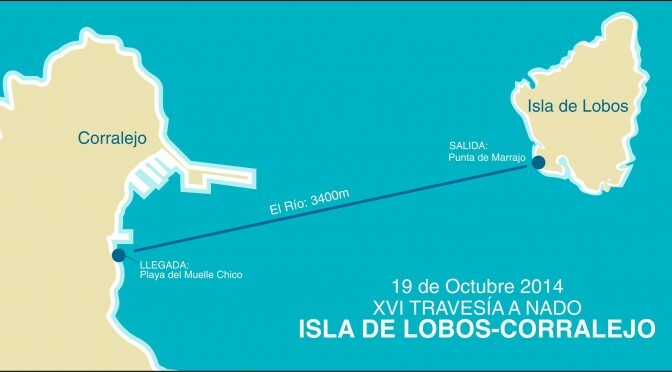 The next outstanding point in the map is “La montaña de la Caldera” whose outline is very representative in the islet of Lobos. This mountain is a volcanic cone that belongs to Bayuyo alignment, of which we spoke in a previous article in our blog. It is 127m high (with impressive views of Lanzarote and Fuerteventura from its summit) and it’s half submerged, housing within it a black sand beach: La Caleta. Towards the wind direction, on the inner side of the caldera, there is a colony of yellow-legged seagulls, and on its most unreachable slopes shearwaters and petrels nest. The next spot is “La playa del Sobrao”, and following the path we get to “El Faro de Martiño”, emblematic sea building to which we have also devoted an article you can also read by clicking on the following link. Under this building the traveller can find a small salt marsh called “La lagunita del faro” , created by the interaction of rain and sea water, and it’s characterized by a striking salt crust caused by quick evaporation, on which you can watch numerous birds like herons, curlews and turnstones. And finally, the end of the track is marked by “Las Lagunitas”, with a very special ecosystem. It’s a hollow separated from the sea by a small sandbar whose bottom is relatively waterproofed by clay deposits. When the tide rises the sea water seeps through and creates lots of little ponds. Three species of plants define this ecosystem botanically: Limonium papilatum, Limonium tuberculatum (which have in Lobos their best populations) and Limonium ovalifolium canariense, a unique endemic species in Lobos islet. This species is able to survive under the water, even in case of large tides. Near “Las Lagunitas” we also find the biggest lime kiln in the islet, whose fuel was extracted from nearby fossil marine deposits which are rich in limestone. In our boat trips from Corralejo we surround the whole Lobos islet, offering sights of all the track we have told you about, but from the sea. We invite you to discover this wonderful islet, both from the water and walking through it. The lighthouse has always been an essential element for men’s life, has allowed them to develop and make progress towards new discoveries, even nowadays it keeps being a great reference point for sailors. If many people know Alexandria Lighthouse, The Colossus or The Tower of Hercules, here in The Canary Islands there is one lighthouse which stands out particularly: Martiño’s Lighthouse, also known as Lobo’s lighthouse, which we can see everyday in our boat trips from Corralejo. It stands out for many reasons: how long it took to build it, five years, due to several difficulties that arose, such as the transport of building materials carried first by camels, then by ships and in the third place by indigenous donkeys found in the very islet of Lobos; or maybe because of the nature of the islet, totally uninhabited, reason why they also had to build houses, underground cisterns, paths and yards so that the engineers, builders and the rest of workers could live for as long as the lighthouse works lasted. Martiño’s Lighthouse started to be built in 1860, after the General Lighting Plan for the Canary Island was passed, and up to now this is the only Official building existing in Lobos. 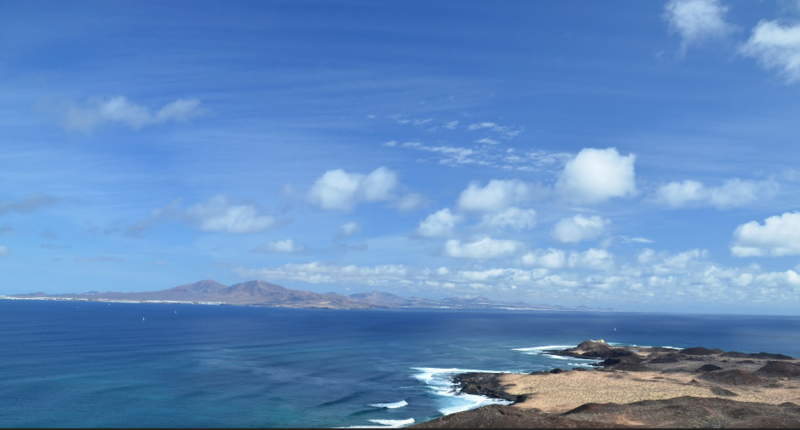 It very much looks like the lighthouses in Pechiguera and the island of Alegranza, in Lanzarote, because the three of them were planned by the same engineer, the renowned Juan León y Castillo, born in Gran Canaria. The final outcome was a lighthouse with neoclassical style, white and yellow, 29m above sea-level. Besides the cylindrical-conical tower of the lighthouse, which is 6m. high, there is a one-storey building attached, which at the beginning was Juan León y Castillo’s occasional residence, when he visited the islet to supervise the project and later on it would be the lighthouse-keeper and his family’s residence. A cistern for the lighthouse itself was also built, located under the lighthouse, and it stored rainwater coming from the rooftop terrace to ensure water supply. lighting with beacons the passage of vessels through the Bocaina Strait separating Fuerteventura from Lanzarote, and forming a triangle with Tostón Lighthouse in El Cotillo and Pechiguera lighthouse in Lanzarote. With Lobos and its Martiño’s Lighthouse more specifically several personalities are related, among them writers like Josefina Plá, daughter of the lighthouse keeper Leopoldo Plá, who was born in 1903 and was brought up in the very lighthouse although later on she would develop her career in Paraguay. Or José Rial, who was a lighthouse keeper in Lobos since 1913 and thirteen years later he would write a novel about the island and his experiences there. Another renowned person was Antonio Hernández Páez, also known as Antoñito “the lighthouse keeper”, who actually was the last one to develop this task from the year 1936 until 1968, and also the last one to inhabit this islet. Antoñito also set up a typical restaurant there, at present run by his descendants and where you can taste fresh fish and delicious “paella” as an extra activity to be added to our trips from Corralejo. So, it’s highly recommendable to visit Lobos and its lighthouse because of its history and the natural charm of the islet. Moreover, the visitor who climbs up Martiño’s lighthouse will enjoy breathtaking views. As many of you know, one of the greatest attractions of our boat trips from Corralejo is the visit to our neighbour islet of Lobos. The islet of Lobos was named like this after a colony where a great deal of monk seals from the Mediterranean (Monachus monachus),also known as sea lions or sea cows, lived and nowadays they have completely disappeared from our coasts. The quality and marine biodiversity in these waters, together with the loneliness and isolation they enjoyed in that environment turned the islet of Lobos into an excellent retreat for the development of this species, which came to gather thousands of specimens. When the conquest of this island began to take place these animals were chased by the conquerors, who coveted their fur, grease and meat, causing the extinction of this species in our coasts in the Middle Ages. The Monk Seal from the Mediterranean Sea is a pinniped mammal, from the family Phocidae, and it’s one of the most weird species that exist. In ancient times it inhabited the whole Mediterranean Sea and the Atlantic in the North of Africa, reaching Madeira, The Canary Islands, Cape Verde and its remains date back to 12-14 thousand years. 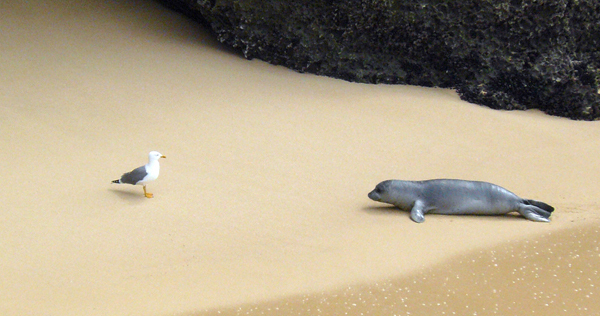 The name of the monk seal has two different interpretations: on the one hand it makes reference to the isolated character of this species, as it inhabits coast areas which are difficult to reach and far away from the human beings —just like the monks, who retrieved themselves in secluded monasteries— and on the other hand, the wrinkles around its neck look like the shawl that Franciscan monks wear on their shoulders. This species usually looks for shelter in sea caves, although in the past, when there were large settlements, they also were on sand beaches. We can easily imagine them sunbathing on the beach of La Concha in the islet of Lobos. In ancient times they spread, as we have already said, all over the Mediterranean, mainly in Spain (Baleares, Cataluña, Alicante, Murcia, Almería and The Canary Islands), but little by little, The man, the fishermen’s greed, who could see their fish shoals threatened, and the boom of tourism took this species to more and more hidden areas, and nowadays, as Spanish specimens, the only ones left are in Chafarinas Islands (Spanish colony in the Alboran Sea, to the west of Melilla). In the rest of The Mediterranean and the Atlantic the number of these specimens has deeply declined to worrying figures, 500 specimens in the whole world, so this is one of the most endangered species in the whole planet. The colonies of Monk seals are led by large male adults. They usually breed in hidden caves not to be disturbed during the ten-month pregnancy, giving birth to just one seal pup that depends entirely on her for three months. They live an average of 20 years, reaching their sexual maturity when they are 4. They live peacefully in herds and they don’t usually go far away from the coast but to forage for food. They eat fish and molluscs, mainly during the night. Their habit to look for food in the fishermen’s nets has turned fishermen into their enemies, and they have been chasing seals for years, which is the main reason for their having become now an endangered species. At present the biggest colony of Monk seals, discovered in 1945, is found in the Cabo Blanco Peninsula (boundary between Mauritania and Western Sahara), with 250 specimens out of the 500 in the whole world, which makes the situation even more dangerous for this species in case the area were affected by any anomalies that could end with a great deal of them being located in the same area (for example, being attacked by toxins, as it already happened in 1977). There is another colony in Madeira. The reasons we have mentioned above make the extinction of this species an imminent event which several projects of recovery are trying to stop. In our next article we will talk about projects of reintroduction, promoted by the General Direction of Nature Conservation in the Ministry of Environment and the Regional Environment Vice-Ministry from the Canary Islands, which is trying to reintroduce this species in the Spanish fauna through The Island.